Under Sensei’s guidance, we began to perform this meditation. I tried to imagine myself as a jug, but my imagination formed this image somehow only half-way, because my mind just couldn’t agree with this definition. 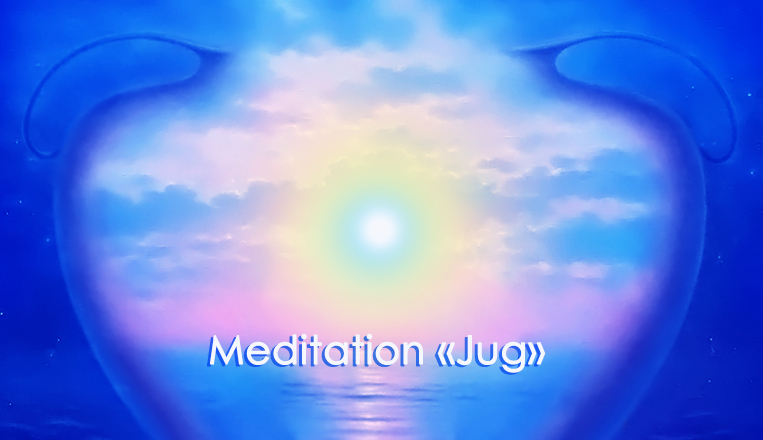 I stopped trying to prove anything to myself and simply thought, “I am a jug,” and concentrated on the ‘internal source of water’. An interesting feeling appeared, as if my consciousness went inside of me, went into my soul, and concentrated in the form of a point in the area of the solar plexus. That point began to widen gradually while crystal clear water spiralled in it. Finally, there was so much water that it poured over, filling my entire body with its pleasant moisture. Filling the ‘vessel’ this way, this pleasant feeling ‘flowed over the edge’. A wave of gentle goosebumps started to run over my body from top to bottom, as though going into the earth. I imagined that my body was being cleansed of all bad thoughts. And in one moment, I felt so nice inside, so cosy, and so joyful that I couldn’t resist and slightly deviated from the meditation, thanking God for all that He gave me in life, for all His Love for His children. In the next moment, I suddenly discovered that my consciousness, in other words, my real “I”, was seemingly above my body. But my body didn’t look like a body at all. From its ‘jug-like’ head emanated thousands of thin, multi-coloured threads which went into the ground in a continuous movement. In the depth of the jug, something bright was shining, transforming these threads into more vivid colours. The beauty was simply spellbinding. But then I heard Sensei’s melodious voice, reaching me from somewhere far away. I quickly came to my senses, though the state of this internal euphoria stayed somewhere in the depth of my “I”. As it later turned out, each of the guys experienced this state differently. The senior guys did it better than I did, while for my friends it all transpired only at the level of bare imagination. Sensei told them that for many people, it often happens this way at first. However, if they practice persistently at home every day and have a desire to improve their moral qualities, then in time they would experience new feelings and learn to constantly control their thoughts. The most important thing is to believe in themselves, in their powers, and not to be lazy”.